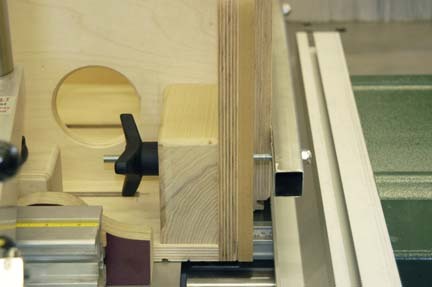 Machining Lock-Miter joints for bookcases and similar shallow boxes using the spindle shaper. This is the setup I prefer for shaping the first joint profile with the Lock-Miter cutter. The first step is making the ZCI insert for the shaper cutout area. This insert is a Baltic Birch sandwich, routed to fit the cutout using a template cutting bit in the router table with the steel shaper insert ring as a guide. A 3" hole-saw was used to make the initial center hole, then the insert was clamped to the table and the Lock-Miter cutter raised into the insert while the shaper was running to complete the ZCI. The next step after the ZCI is fabricated is to set the height of the cutter. The procedure is to machine two scrap pieces of stock, invert one and put the two machined edges together. 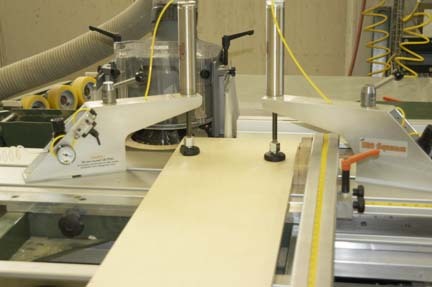 The cutter is at the right height when the outside surfaces of the stock align, as shown in the photos to the right. 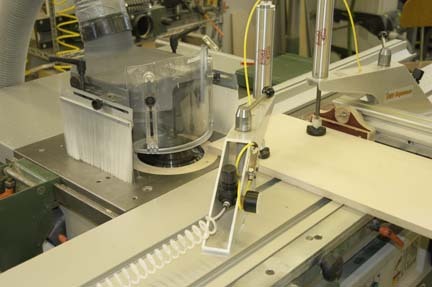 Note that the Felder Lock-Miter cutter is being used in these photos, but a quality router bit in the high speed router spindle (or router adapter) can be used instead with some degradation in quality of cut. I prefer to use the rip fence as a depth stop. The Felder shaper fence can also be used, but I find it more trouble than it's worth for this kind of shaping operation. The shaper fence makes more sense in machining lock-miter joints that are along the long edge of material (in making lock-mitered hollow columns, table legs, etc. ), rather than along the short edge as done here. In this setup, the Aigner BowMouldMaster is used to cover the cutter and provide for dust and chip collection. 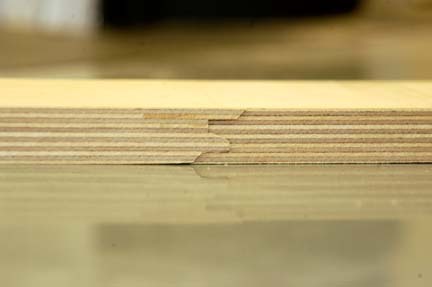 It's worth noting, that the crosscut end-stop can also be used to index the depth of cut. Doing so eliminates the use of the rip fence as a stop, and allows the stock to be left over-length before the lock-miter cut. Machining the mating joint for the lock-miter requires the stock to be fed vertically through the cutter. The shaper fence can be used effectively when machining along the long edge of material in making hollow columns and table legs, etc. When the mating lock-miter joint is at the end of a long narrow board, the shaper fence just isn't adequate to machine the joint with the required accuracy. After lots of experimentation using the Felder shaper fence, I concluded that it's nearly impossible to get a straight clean cut on this machining operation when the stock is relatively long and the joint is on the narrow end - like is shown in this photo. 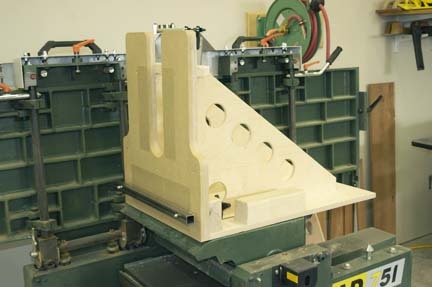 Shorter and narrow pieces can successfully be machined using the shaper fence and some method to hold the stock while hand feeding (such as the Aigner "Clamp Strip" - sold by Felder as the "Workpiece Holder - 01.0.020). I decided to build a jig specific to this machining operation. 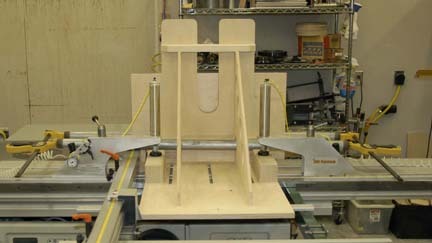 This jig is shown in use in the photo to the right, and details about this jig follow. 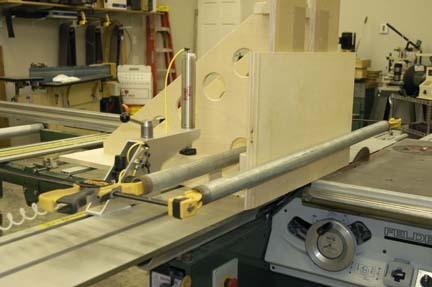 I wanted a jig that would align and hold the stock vertically, and allow me to use the sliding table to move the stock through the machining operation. I decided to build this of Baltic Birch and configure it for use with Brian Lamb's Big Squeeze air clamps, or alternatively be secured to the sliding table with bolts into t-nuts in the t-slots. I wanted to use the crosscut fence as the guide for depth of cut, and eliminate the use of the shaper fence altogether. I prototyped something smaller and lighter than what I ended up with, but decided this jig needed to be very robust to work properly. 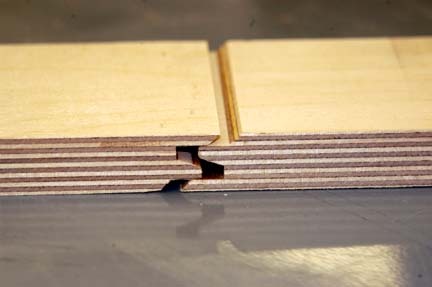 This is the jig removed from the sliding table to show proportions. The vertical face has a removable MDF overlay that's partially covered with 220 grit sandpaper to more fully secure the stock from movement during machining. The clamping arrangement is a 1x1 inch steel tube (purchased at Home Depot) with threaded rod through the face to winged knobs. The inside face of the steel tube is covered with sandpaper as well. 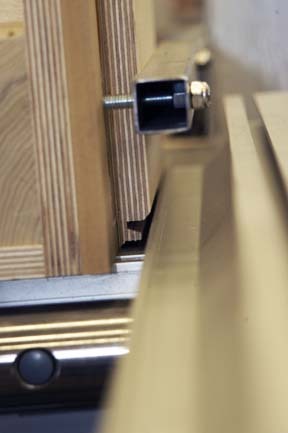 Shown here is a detail of the clamping bar arrangement. If you look closely you can see the resulting lock-miter cut in the stock that's mounted to the jig. Again, I used the rip fence as a stop for initial alignment of the cut. The basic procedure is to advance the depth of cut until the 45 degree cut just reaches the outside lower edge of the stock. I set the jig to cut over-deep (closer to the cutter than is required) and then used the micro adjuster on the rip fence to move the entire jig away from the cutter a bit at a time until the correct alignment was achieved using scrap stock of the same thickness. This clamping bar arrangement surprised me in terms of its effectiveness. It holds the stock very securely and will even flatten a slightly cupped or warped board end. The stock is loaded into the jig and allowed to rest on the flat cast iron table surface for alignment, then the clamping bar is tightened down against the stock. You must cut the stock to the exact length before doing this machining operation. It is not possible to leave the stock over-length and let the lock-miter cutter trim it to finished length when doing the vertical cut. It is critically important that the face of the jig be square to the trajectory of the sliding table - otherwise the machining operation will cut a tapered lock-miter. 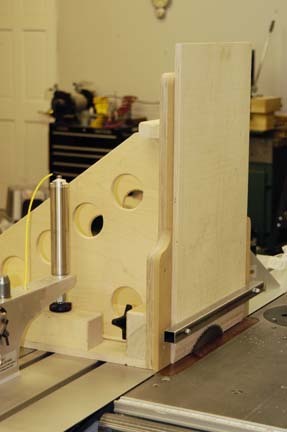 To double check the alignment, I used a dial indictor secured to the iron top indicating to the face of the jig, and then moved the slider back and forth. Best to have your crosscut fence dialed in square before you begin. It is also critical that the face of the jig be vertically square to the iron to of the table, otherwise the joints will not be square when clamped for glue-up. The most accurate method of verifying the vertical alignment is to attach a dial indicator to the shaper spindle (magnetic base helps) and indicate to the face of the jig - then elevate the spindle vertically and look for any error. The indicator should read within a few thousandths as you raise/lower the spindle if the jig face is accurately aligned and the spindle doesn't rotate as it's elevated. Alternatively, if you have a precision square, you can verify the vertical face to the iron top of the machine. 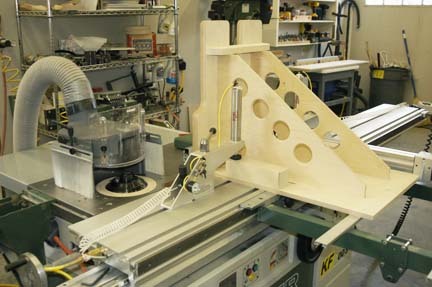 This is the jig mounted to the sliding table and outrigger using the Big Squeeze air clamps. 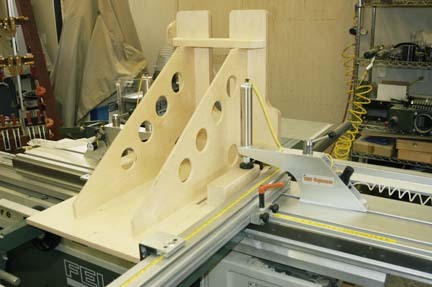 The blocks on the jig under the air clamps reduce the amount of projection of the ram in the air clamp. This makes the jig less likely to shift during machining. If the ram in the clamp is fully extended, it is less able to withstand lateral pressure. It's also important that the bottom of the jig be totally flat and raw wood. My first attempt at the jig used a phenolic coated plywood for a base, and it was so slick that the jig shifted during use. This photo shows the cutouts in the base for alternatively securing it to the sliding table with bolts into t-nuts. 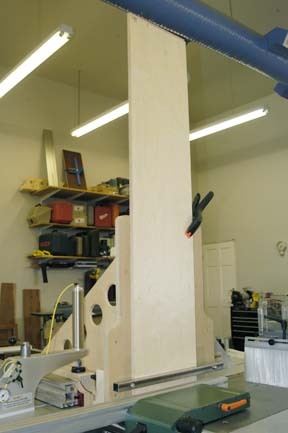 All of the parts of this jig (except the sacrificial MDF face) are plywood. I have found in past jigs that using solid stock can lead to problems in the jigs staying square as humidity changes. So even the larger sections here are sandwiched Baltic Birch. The jig can also be used for a variety of other machining operations at the saw or shaper where the stock must be held vertically. 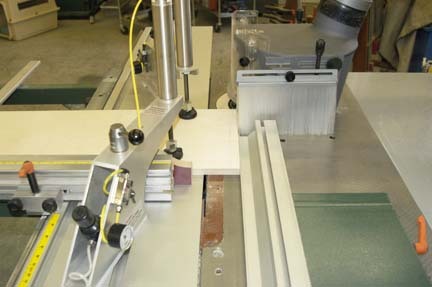 An example is using the saw to machine an angled raised panel profile as shown on the right. 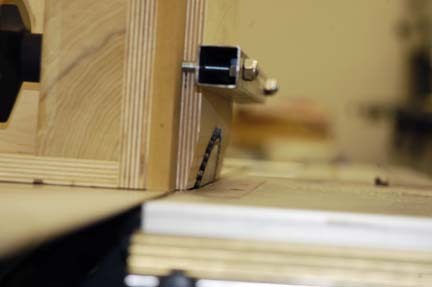 Here is a close-up of panel raising technique using the jig with the saw blade tilted. 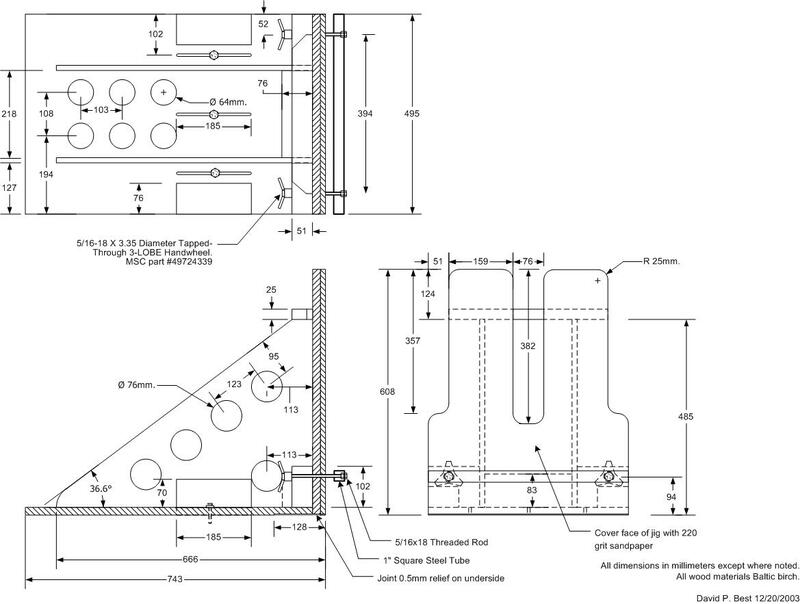 If the stock is too wide to fit under the square clamping bar, the bar can be taken off, and round pipes with clamps can be used to extend the width as shown here. You could also use a pipe through the round cutouts and a 2x4 against the stock. 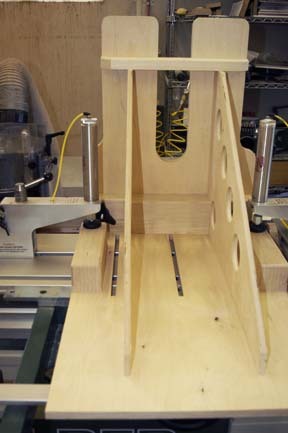 Since this clamping arrangement extends past the jig, if you get carried away with the clamping pressure the jig face will distort - so go easy. This is another view of the jig with pipes and clamps used to secure extra wide stock. Thanks to Brian Lamb for this suggestion. A drawing of the jig follows in case you decide to make your own version.